Remembering the train cars of old. A set of Brooklyn Union Elevated cars approaches the Brighton Beach elevated station on Sunday, June 18th. I’m not a train geek; I’m a New York geek. My primary interest in the subways has been its condition as the world’s biggest museum—its remaining ancient signage, design, and abandoned and underused stations and lines, more of which disappear every year. Yet, in riding for hours on these old cars that have been lovingly and painstakingly restored to running condition, and repainted and reappointed as they were when they first ran, I suppose that I find myself awash in a reverie of retro-nostalgia: the remembrance of things and events that happened before my own experience. When I first started riding the trains in the swingin’ sixties, we were in the tail-end of of the ceiling fan, porcelain handhold, wicker-seated cars era. But that wasn’t my subway era. The TA, as it was called then, had begun gradually easing out detail as early as the 1940s. By the '70s, waves of financial crises and yes, neglect and willful destruction on the part of the public, had left our public transportation graffiti-scarred and reeking of urine. There were track fires, station closings; I remember subway cars identified by letters scrawled on paper taped to the “railfan windows” by the motorman’s station in the first car. In 2017, despite coming back from the brink of that era, deferred maintenance has left us once again in trouble that rivals the bad old days, but without the graffiti. On Father’s Day, Sunday, June 18th, the NYC Metropolitan Transit Authority (operating under the Transit Museum umbrella) rolled out several aged trainsets in southern Brooklyn originating at the Brighton Beach station, rolling between that station and Ocean Parkway and the Kings Highway stations, in what was called the Parade of Trains. Included were Brooklyn Union Elevated trains built in 1907 and running in regular service in some cases until 1969, D-Type Triplex cars that operated from 1924 to 1965, and cars built for the new Independent Subway, the first to receive the R-designation, which ran on various lines from 1930 to 1977. The Brooklyn Union el cars, named for the railroad that originally ran them, actually plied surface railroads when first built, and the exteriors are made of wood with steel frames. After elevated trains began to operate in Brooklyn and Queens beginning in the mid-1910s, the trains were modified to be used for service to the 1939 World’s Fair over the Flushing Line, which entailed enclosing the entrance gates at the front and back of the cars. Some of these enclosed wooden cars were used on the Myrtle Avenue El in its later years, before the line’s closure in 1969. 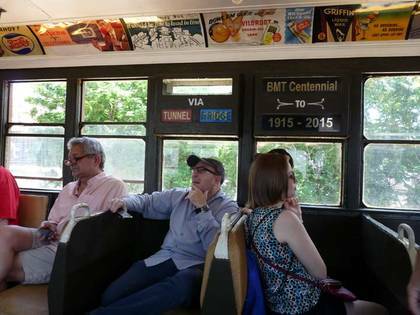 Some years later, a number of those cars were converted back to open gate operation by the Transit Museum and are used on excursions and exhibits such as the Parade of Trains. 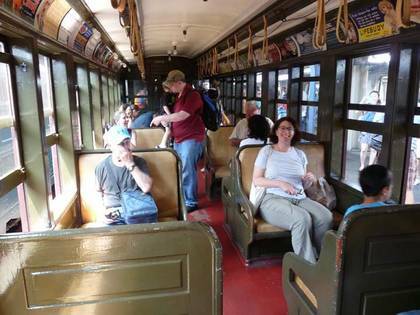 However, for safety’s sake, pedestrians cannot ride the BU cars while they are in tunnels—the Museum always includes iron cars in trainsets for mixed tunnel and el rides. Today, there was no such worry, as the entire route was above ground, and “Parade” goers happily piled into the old cars with their molded seats, actual leather straps held for balance, and woven wicker seats that ran the stockings of generations of female passengers. Only the breeze from open windows cooled riders in the warm months, while heaters beneath seats helped out during the winter. In many cases, seats were positioned so riders could look at the outside world instead of fellow passengers across the aisle, an arrangement current subway car designers disdain. 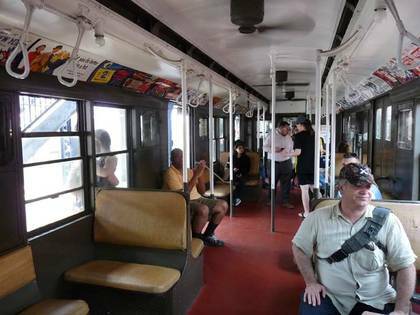 Originally operating on BMT (Brooklyn-Manhattan Transit) lines, these units, called Triplexes because they come in sets of three articulated (nonseparable) cars, were introduced in the late 1920s and featured metal insides and outsides as a safety measure to replace the older wooden cars. While largely maintaining the appearance of the wood cars, there were innovations like ceiling fans and porcelain handholds, replacing the old leathern straps. These cars ran on the 4th Avenue, Brighton, Nassau Street, and West End lines, but their tenure was relatively short with the last unit taken out of service in 1965. The first R-1 cars, with R standing for Revenue, were built for the new Independent Subway 8th Avenue Line in 1930, and similar cars in its series up to the R-9 (known by train buffs as the “Arnine”) were produced until 1940. These cars shared many similarities with the Triplexes and el cars that preceded them in appearance. Most were retired by 1970 in the case of the R-1, and by 1977 in the case of the R-9. It is these cars that I recall still in service when I took a rare ride to Ridgewood on the L train; I marveled at the ceiling fans, wicker seats, steel dust smell, and the faint woop-woop sound the ceiling fans made. Unfortunately, I didn’t carry a camera everywhere I went at the time, and so that transcendent experience resides only in my memory.